DEP was discussed at a high level in the previous post; it is a facilitator for corporate owned iOS devices to be quickly enrolled into MDM solutions, all of the major MDM vendors support this. First off, an account is required to manage the DEP portal and the devices within it. This is essentially another Apple ID which is created at https://deploy.apple.com – I think it is worth pointing out here that I tried using the same account that was used for management of the APNS certificate to start with and this wasn’t allowed so be prepared to manage two accounts going forward, one for DEP and one for APNS. In order to link the two systems a token needs to be uploaded from AirWatch to DEP so from within this section, select to download the MDM public key file and then click the link to be taken straight to the DEP page and log in with the account created previously. Once within the DEP portal you may be startled by how sparse it is, there really isn’t very much one can achieve in there over and above the initial setup. Considering DEP holds your organisations inventory of iOS devices you may think you could run reports and so on from here but this is not the case. DEP will provide a very high level overview of what is in inventory and some rudimentary details of the MDM server(s) (yes you can add more than one) that is linked to the DEP account, other than that all other management and reporting is handled within the MDM tool. Going back to the implementation, click the ‘Get Started’ link and you will be prompted to setup two-factor verification link via SMS to a mobile phone. Multiple numbers can be used in case of different admins logging in (but note using the same Apple DEP account) but this needs to be used on every single login to the portal. At the following screen upload the pem token generated on the AirWatch server a previously, click next and in return you can download the Apple Server token file which is to be uploaded to the AirWatch server – As you can see this linking process results in a bi-directional trust between Apple and in this case, AirWatch. Finally there is the opportunity to assign devices if they are actually ready at this point, which can be assigned via either order number of by serial number. At this point it should be explained that DEP only ties into affiliated Apple resellers, if you do not purchase them from such a supplier DEP will not be an option for you so ensure you ask this question of the supplier before committing to an order. Personally I would always use the Order option as you will get the whole lot dumped in there with no messing about, in fact once up and running the supplier can simply drop devices into the portal (you will receive an email notification) and so long as the ‘assign automatically’ box was ticked on the server setup in the previous section, no further administrative action is required on your part. If you like though, you can not do this and paste in the serial numbers to DEP and have them enabled that way. So here we are back at the AirWatch Console and we are now in a position to create the first DEP profile via completion of the DEP wizard. First of all you’ll be prompted to upload the Apple Server token file that was downloaded from the DEP portal previously to complete the linking process. Note, if Single or user device is set an AirWatch basic account would be selected and used to enrol the device which can help place the device into a specific Organisation Group. Corporate Shared would be better using no authentication and staged as the below screenshot shows but instead selecting the ‘Multi-User device’ staging mode. Users can then authenticate as and when each time the ‘check out’ a device so it can be returned to the pool for the next user. Lastly in this section, the device ownership is selected for the profile along with the organisation group where you want the device to land once enrolled. These options will change again based upon previous selections, for example if Multi-User Device is selected, ‘Corporate Shared’ will be enforced and greyed out. Here we set the Profile Name, Department and Support number which are compulsory free text fields followed by some DEP specific MDM settings. Require MDM enrolment – Yes there is an option disable enrolment as part of this process, I really don’t know why you would disable this but the option to skip is here folks if you chose to. This is pretty smart because if there are ever any issues with the iPad or there is a change of ownership, you can send the device a full device wipe instead of an enterprise wipe; it will then be back to an out of the box configuration maintaining the enrolment settings and enforcement into the MDM server. Lock MDM Profile – Again mentioned in the previous post, for Corporate owned, this would normally be enabled so that the secure profile cannot be removed by the end user. Device Pairing – This is whether you want the end users in question to be able to connect the mobile device via ISB to a workstation to use things like iTunes. This is probably the only option here that’s worth giving any real amount of thought to disabling. The ‘Hola’ welcome wizard that most iOS users see out of the box can be tailored in this section to streamline the start-up process. I’m not convinced these require much explanation as they are fairly self explanatory but most of these would be set to ‘skip’ to make the process fast for the end users. It is worth not skipping the Apple ID though as a valid ID will be required to download the MDM agent on enrolment from the Apple Store. Most of the other items can be managed via MDM profiles anyway. Something very important not to miss in order to close this process off, is to actually assign the DEP profile to the devices. 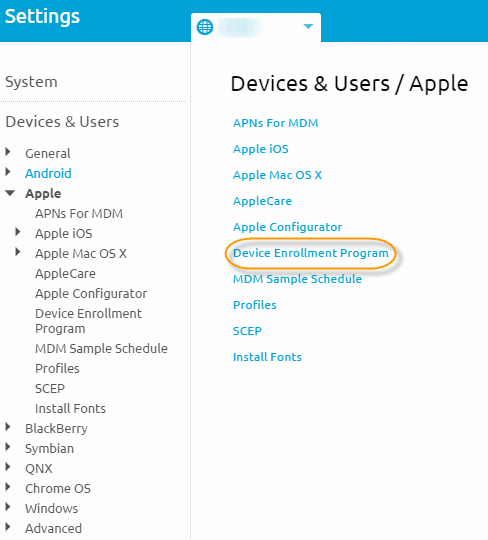 Going to the Device > Lifecycle > Enrollment Status page you can select one multiple or all devices. Then select to assign DEP profile as shown below. This can be a bit of a pain if you have multiple DEP profiles to assign to different devices. Just a short one this. I recently came across a customer who required integration with an on-prem Certificate Authority so it could be integrated into a particular profile (maybe more on this another time). I noticed they were already using Directory integration for enrollment and assigning resources so I assumed an ACC would already be in place. I was wrong about this however as they were using the now legacy EIS component for this (I did find this out before I got there!). The AirWatch Enterprise Integration Service (EIS) provides organizations the ability to securely integrate with back-end enterprise systems from either the AirWatch SaaS environment or a remote network zone (for example, a DMZ). This integration allows organizations to leverage the benefits of SaaS and their existing LDAP, CA, email, and other back-end systems. Sounds just like the ACC (AirWatch Cloud Connector) huh? Well it does the same thing but the ACC is current, whereas EIS is now considered legacy. EIS is a bit more of a painful to configure than ACC though as it really requires secure DMZ placement due to it needing inbound communication from the AirWatch Console Server. ACC on the other hand only requires an outbound web connection to the AirWatch Cloud Messaging Service so can quite happily sit on the internal LAN somewhere and go out directly or via a proxy if needed. Despite this, EIS is still in support however and oddly AirWatch are still (on version 8 for example) producing 33 page integration guides fot it which have no mention of the ACC. EIS doesn’t support quite as many integration points as the ACC does, and for Certificate Services an additional and purchasable add-on pack is required. It’s not as daunting as it may first look, I had a new virtual server ready to run as an ACC so I went ahead and pressed the button, you then go through the ACC installation as normal. The integration points (directory services in this case) that were previously using EIS remain just as before. These are independently configured nodes so will just carry on and the old EIS server will just be ignored and can be switched off. I then went ahead and implemented the Certificate Authority integration through the ACC so I could use it in my target device profile. I’ve been working on a couple of AirWatch engagements recently and as a result, my product knowledge has had to move to a lower level. Being more of a ‘Citrix Guy’; from an MDM perspective I’ve had more involvement in XenMobile up until now, but seeing as Citrix is deemed a 2nd tier vendor by the likes of research firm IDC, it’s surprising the lack of resources there is out there for top tier AirWatch compared to XenMobile. Maybe it’s because AirWatch really push the SaaS model where the on-prem is the poor relation (~70/30 market split) so there is less community interest out there. 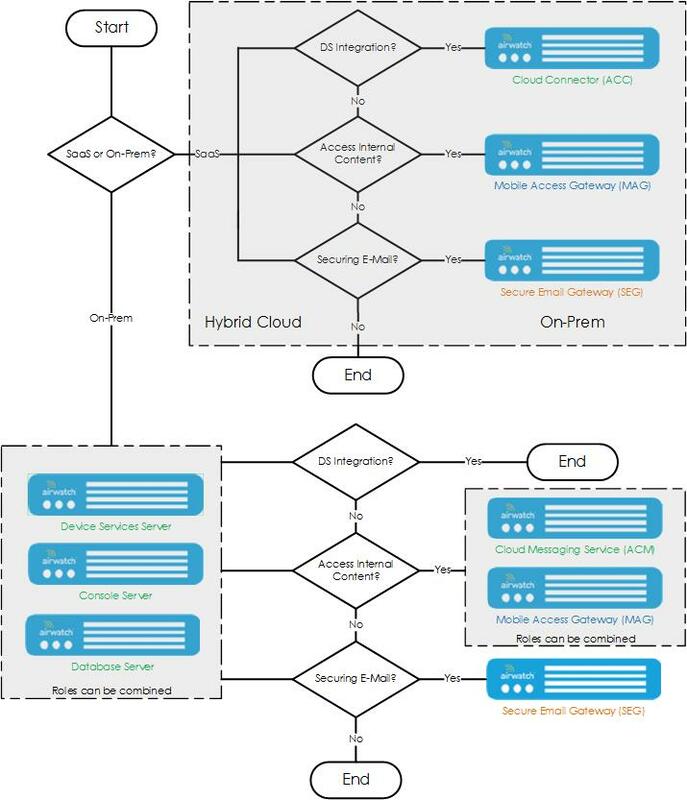 What I wanted to cover here was how the headline products fit into the AirWatch architecture as at first glance it’s not obvious, to this end I have created a flow chart as a kind of decision matrix. The components will change depending upon requirements and if SaaS is chosen over on-prem. Device Services Server – This is the Server that actively communicates with the devices and handles enrollments. Seeing as devices will normally be anywhere and everywhere, this server needs to be available on the internet. For SaaS deployments, clearly this will be handled but for On-Prem, this will normally located within a DMZ with SSL punched through to the internet secured with a public certificate. Console Server – Sometimes called the API server, the server communicates with the Device Services Server and contains a Web App (IIS Site) for administrative control of the environment. This will normally be placed on the internal LAN, but would be possible to combine with the Device Services Server. Database Server – As with most enterprise products a database is required; clearly AirWatch holds a lot of device data and this needs to be stored somewhere. Note that SQL is the only supported database type and it needs to be full SQL, not express. Again, this could be combined but in larger deployments would be separated to aid with high availability plans. In a SaaS deployment, all of the above will be hosted and managed by AirWatch, but required for all deployments be they SaaS or on-prem. The following components however, are optional depending upon requirements. AirWatch Cloud Connector (ACC) – This is nearly always used in SaaS only deployments for bringing the above three components to local customer based back-end resources. Typical integration components would be Directory Services (LDAP), Microsoft Certificate Services, and Exchange to name a few. If you have a SaaS deployment, your AD is locally hosted and you want to configure Auto enrollment for end users to use their email addresses for example, you’ll be needing ACC. This is normally placed on the internal LAN with a direct outbound connection to the internet so it can communicate with the AirWatch SaaS. This can be either direct (preferable) or via internal proxy. Just a quick note on connecting components via proxy – At the time of writing (v8.0.1.0) proxy PAC files are not supported in the ACC but they are for the MAG! 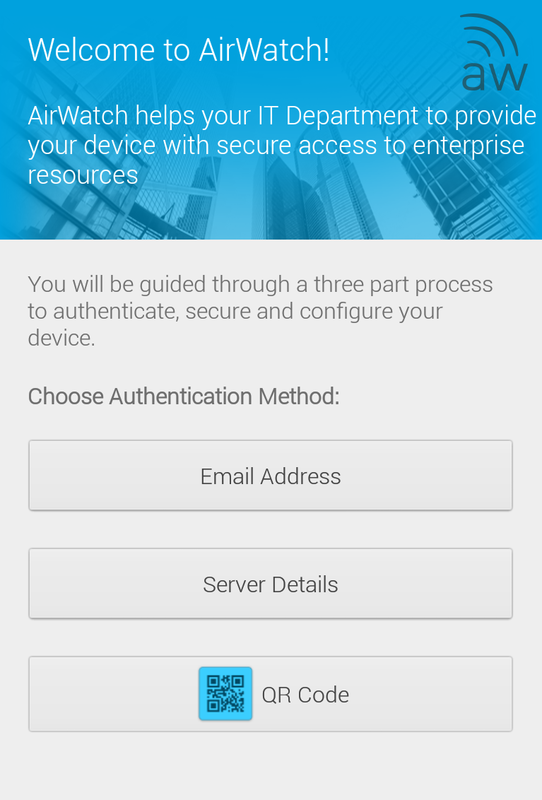 AirWatch Content Gateway, formerly Mobile Access Gateway (MAG) – The MAG (also known as MAG Endpoint) is a relay for accessing internal content. It differs from the ACC which is more about authentication where the MAG is proxy and content. This component is secured in terms of Airwatch (‘Containerised’) so if you plan to use it you will need to be using one of the AirWatch client based products to access the content, that being Secure Content Locker, the AirWatch Browser and Enterprise Apps that have been subject to AirWatch App Wrapping. In terms of placement there are a number of options. Really, being a reverse proxy, this is a DMZ type of component but could be a pain to manage as and when you want to open it up to more back end resources, this is because you would need to add rules for each server (unless you cheat and open up a subnet or whatever). If you have no DMZ, it’s simple as there is only one option which will be LAN placement. If you do have a DMZ the best approach would again be internal LAN but also to use the additional sub-component…. AirWatch Content Gateway Relay, formerly Mobile Access Gateway (MAG) Relay – This is part of the same installer as the above but you just choose the relay option. This is designed to be placed in a DMZ and is what your external devices will be pointing at along with the AirWatch Cloud Messaging Service. This simplifies ongoing management in a DMZ scenario as the internal ‘MAG Endpoint’ server can be left fully open to chat to all internal resources whilst the communication remains secure with the relay handling connectivity between the devices, AWCM and the internal MAG. In the MAG configuration on the AirWatch management console it just needs to be told that’s it’s using the relay model rather than basic endpoint. AirWatch Tunnel – This is a Linux based product that I suspect at some point this will replace the Windows based Content Gateway. For the time being though, both are required if you want to externally publish Content for use with the Content Locker Client App, Wrapped applications and Per-App VPN. In a nutshell, AirWatch Tunnel doesn’t yet work with Content Locker and the Content Gateway doesn’t work with Per-App VPN (and probably never will). Like the Content Gateway, this is also available as a Relay configuration. Something to bear in mind is that as mentioned this is Linux based installation. This does not mean as I expected a virtual appliance, it’s purely a Linux installation which requires CentOS or Red Hat Enterprise, so you’ll need a level of Linux capability to implement this. Secure Email Gateway (SEG) – Let’s be clear, the SEG isn’t a requirement for end users to be receiving emails on their devices but it is certainly beneficial. The SEG sits between your Exchange ActiveSync server(s) and enables greater control and monitoring of email to and from enrolled devices. ActiveSync is globally enabled on Exchange and while it can be switched off on a mailbox basis and (since Exchange 2010 SP2) be subject to device quarantine rules, it is not very easy to control. The SEG will proxy the ActiveSync communications and block/allow depending upon configured policy. Cloud Messaging Service – This is mentioned for information, it’s a different sort of component to the above as it is a facilitator rather than something that performs it’s own specific front end function but it is important. It handles messages from the Administrative Console, and is a pre-requisite for both the MAG and ACC. For SaaS deployments this isn’t a consideration as it is preconfigured by AirWatch but for on-prem this needs to be installed and configured, typically on the Device Service Server. Seeing as the ACC is generally only used in SaaS implementations though, this is normally only a concern for MAG installations. Part of the MAG configuration requires the Cloud Messaging Service details to be entered. Something else to bear in mind is licencing as these components don’t directly fit into their licencing models – well they do, but you have to base the components on the requirements and subsequent licencing model, which will spit out the required components. The licencing models and pricing is available publicly here. You could actually integrate any of the below components and no licensing would be breached but take for example the MAG; yes this could be fully integrated into AirWatch but unless you are doing App Wrapping, using the AirWatch Browser and/or Content Locker (which would require a ‘Blue’ license) it’s inclusion would have no benefit. So what I’ve done on the flow diagram is to colour the text in accordance with the required licencing banding assuming you are requiring features that require the component in question. So without further ado, here is the flowchart I have created help with all of this. Note the decision questions are very high level, other questions could be asked of the capabilities particularly around the ACC which has many integration points.